Auckland’s “economic power base” is set to shift as two massive developments – the $1.4b Waterview motorway connection and the multi-million dollar metropolitan expansion centred on Westgate – edge closer to completion. He says the traditional model of a central business district (CBD) with retail centres like New Lynn, Glenfield and St Lukes positioned 10 to 20 kms away is ceding dominance to a new “ring” of metropolitan centres – in particular the big five of Albany, Newmarket, Sylvia Park, Manukau and Westgate, all of which have direct and easy access to motorways. “In the future you may wake up in Mt Albert, say, on a Saturday morning and think ‘where can I find a Harvey Norman store a 10-15 minute drive time away?’. The answer will be you can turn right and drive to Manukau or turn left and go to Westgate. “In the past Manukau or Westgate would probably not have been in the thinking of Mt Albert residents but that is what motorways do,” he says. 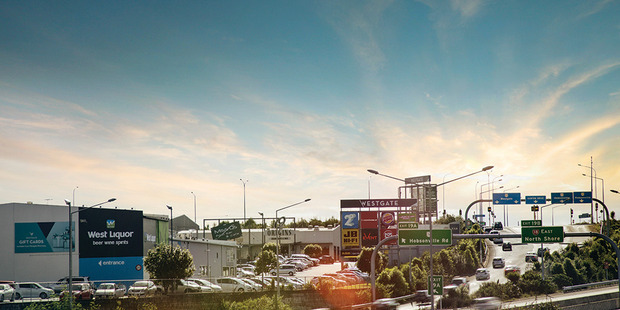 The motorway project will give Auckland an effective “ring road” around the city by connecting the south western and north western motorways, creating a continuous 48km stretch of road between Manukau and Albany; while the Westgate development will complete the big five metropolitan centres strategically located on the “ring”. “It is as much about the north of Auckland growing west as it is the about the west growing northwards. It is a joining of sensible dots, the connecting of the missing links, that’s why Westgate is such a compelling story, ” he says. Barbour says the concept of a Westgate-style metropolitan centre is not unique in New Zealand. “In 1965 there were paddocks at Manukau, in the 1980s there were orchards in Albany. Both here and all over the world you can’t have huge populations without the live, work, play mix. “What makes Westgate such a powerful cocktail is that it is not just about retail. It is a place that, yes, will be a shopping destination but also a place where people live, do business, where there are hospitality services and transport hubs. The Waterview connection is due for completion next year. At Westgate 240,000 sq m of new retail space – including the Northwest Mall which opened last year – is already well progressed, while a large number of the planned 30,000 additional homes at Westgate and its surrounding areas are in the pipeline. As a result new housing estates are springing up in throughout the north-west in areas like Whenuapai, Hobsonville, Riverhead and Kumeu/Huapai. In 10 to 30 years a population at least the size of Dunedin (population 123,000) is expected to be living in the district. Barbour says north-west locals “understand there is huge change coming to our well-kept secret”. He says they are excited but also concerned that infrastructure like roading, schools and recreational facilities keep up with the rate of growth. Bennett says the remarkable thing about the north-west is the sheer scale of growth.